Freakshow ITC Rogue Trader - now with pics! So I decided to give it another go at a local event with fewer players. Among others, there were just as many Eldar players with their Wraithknights, plus a player looking to get a last hoorah in with Drop Pod Skitarii before FAQs get finalized, and a few players like me looking to score a win with a fringe list--including a beautifully painted Sisters of Battle/Space Wolves force and a huge ork horde list. Fortunately for me, the TO of the smaller event had chosen not to house-rule Corsairs and their psychic powers beyond the shackles already put on the army by the ITC, which definitely helped the list out quite a bit. They also ruled that coterie specializations were selected before game began, and did not have to be the same between games. This was the stereotypical bad first round matchup you get sometimes. Although the opponent was a true sport, the armies were just wildly unbalanced against one another. The Runes of Fate Farseer took Eldritch Storm, and aided by his firepower, the elves were able to just roll the orks off the table within three turns or so. The first turn e-storm took out nearly half the orks on the table, with sustained psychic fire helping to mop up crippled units in later turns. The orks tried to charge up in the only tactic that really works for them, but the grotesques were more than a match for the injured mobs. Probably the most interesting game I played all day. 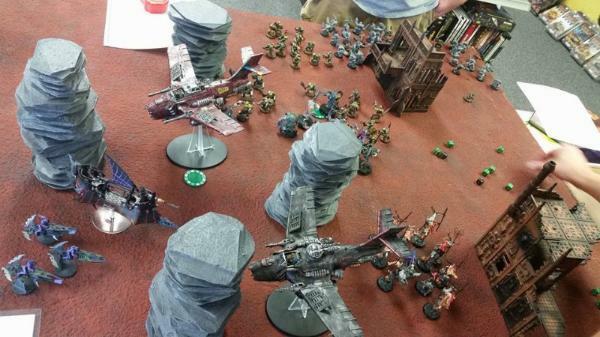 Long board edge deployment played a critical role in this game, as did the Titan Breakers coterie specialization. Another big factor was my warlord trait, Master of Ambush. Infiltrating the Seer Council made a huge difference, as it allowed them to start scant inches from my opponent's deployment zone. A poor Warp Blink roll left my Grotesque Bomb well outside of charge range. 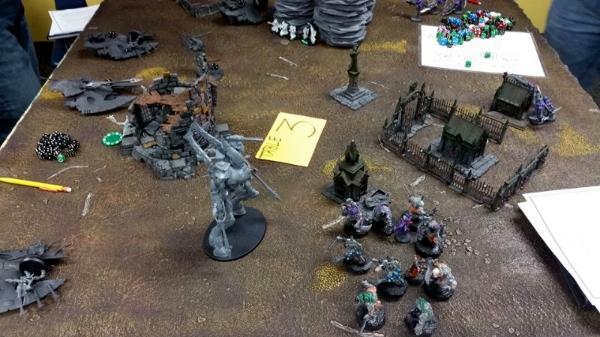 Although I had intended to use them to charge the side of the enemy line with the Knight, crushing a wave serpent and the wraithcannon wraithguard inside before attacking the knight to tarpit him a while, my opponent obliged at least part of my plan by charging the grots with the knight himself. Although the Void Dreamer was able to get a few good licks in (her Fleshbane staff really does wonders when she's protected by the grots), a brutal stomp removed her before I could do a significant amount of damage. On the other side of the board, things went much more smoothly. 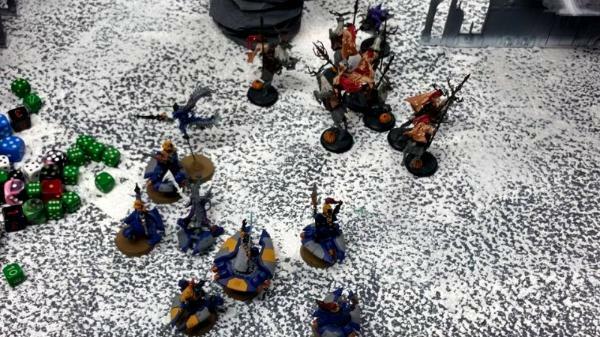 The smaller grotesque squad was able to box in one of the wave serpents, and even weather the d-scythe overwatch fire to charge the unit inside once their serpent was cracked open by the scatterbikes. The greater mobility of the seer council won out for them in the end: they were able to avoid anything but the long range firepower of the tanks, staying well outside the template zones of the wraith units, in order to annihilate any infantry that found themselves outside the shelter of a transport. In the end, the Wraithknight dug in on one of the objectives, dancing between it and my board edge to try to wrangle as many Maelstrom points as possible. The seer council ended up being the only thing able to get close, and we closed the last two or three turns with the seers and the knight bouncing back and forth in a perverse tango, each trying to stay out of the other's charge range, until finally the knight succumbed to the weight of psychic shooting. Although it never appeared that way to both of us at one time, this game was actually remarkably close. In the opening turn, my shooting was nothing short of abysmal, my luck finally turning in a horrendous show of karmic retribution. Short edge deployment, of course, does nothing for the the footslogging grots, who wound up eating gunfire for three turns before they could finally catch an enemy unit, and although they tore the Warp Spiders to pieces, the second squad of spiders, as well as the far more dangerous wraithknight, charged them directly afterwards. The scatterbike on scatterbike conflict was barbaric. It didn't help that my opponent also had warp spiders, but two of those three units would spend the majority of the game combatting the grotbomb, which helped significantly. My opponent, on the other hand, enjoyed a spectacular first couple of turns, retaliating against my earlier advance with true brutality. Only my seer council escaped truly unscathed, and despite throwing a huge number of dice to try and deny the enemy Gate of Infinity, the enemy seer council crossed the entire board in a single turn. Fortunately, as the seer councils squared off, my luck began to turn. The ITC nerf to Invisibility allowed me to target the enemy unit with blasts and templates, and after an Eldritch Storm, an Executioner, and a lucky roll on a Fortuned Psychic Shriek, (with a die roll of 16 on top of the negatives from the Mask of Secrets, Freakish Spectacle, and an earlier Terrify) the enemy Seer Council was in dire straits. The two seer councils engaged in epic fisticuffs, and although I was unable to prevent them from becoming Invisible in later rounds, they eventually fell beneath my spears. The Wraithknight managed to emerge triumphant from his conflict, but it was a pyrrhic victory. The Void Dreamer, hiding behind her meat wall, had exacted a horrific toll on the gargantuan creature, who emerged from his fight with a four wound deficit. The final phase of the game saw the remaining fast units scrambling to accomplish maelstrom objectives, including a pitched fist fight between the small grot unit and the enemies in the center. Finally, the game ended with a draw for the primary objective (each of us holding our own Emperor's Will objective with a single unit cowering in the backfield) and the Freakshow eking out the Maelstrom victory by a slim margin! Result: 9-4 (I believe) victory! Final Result: 1st Place Victory for the Freakshow! Sounds like some interesting games, and well done on the win. Is the second opponent's list legal? I didn't think you could take an Allied detachment with the same faction as the primary detachment. In general, what is your approach to dealing with Wraithknights? Is it a combination of tie up with Grotesques and psychic shenanigans with the Seer Council? As per the restrictions in the BRB the second opponent's list should not be legal do to the Allied Detachment being the same as their Primary Detachment. Unless the rules pack for the event changed that. Your list is quite unique, not my thing but you have successfully demonstrated that the freakshow can hang at tournaments. Congrats mate! Please keep posting! Let us know what your thinking and how your list and tactics evolve. That last battle sounded especially fun, good stuff. Subject: Re: Freakshow ITC Rogue Trader - now with pics!